This is the second concert of the Flûtes en Vacance series which will take place between 28th May and 1st June. The series features Maltese and Scottish flautists studying at Edinburgh Napier University performing in various flute ensembles. The series is funded by the Napier Student Initiative Grant and the Malta Arts Fund.The second concert in the series features the Napier Flute Ensemble which consists of 6 flautists: Rebekah Donn, Holly Thomson, Michael Ready, Kinga Zaborowska, and Maltese flautists Laura Cioffi and Clara Galea. They are all reading towards a BMus (Hons) at Edinburgh Napier University with Andrea Kuypers. 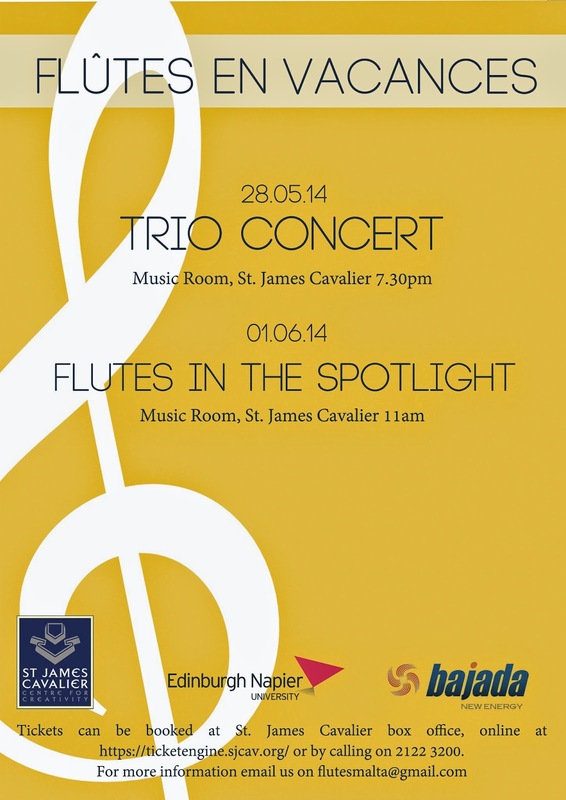 They present a concert featuring different types of flutes with a special focus on Scottish and Maltese composers. This concert features a number of Maltese premieres of compositions written for flutes. There will be a pre-concert discussion at 6:45 with the performers and the Maltese composers whose works will be performed on writing contemporary music for flutes and the performance issues found in contemporary music. The concert will also be followed by a short reception where the audience will have more opportunity get to know the performers and the composers and ask any questions. Bozza - Jour d'Été à la Montagne (I. Pastorale; IV. Ronde).